It was a semi-early rise for me on day two of my Tokyo Trip. I showered, gathered my things and went down to enjoy the lovely complimentary continental breakfast (say that three times fast!). I should have known it wouldn't be a western style continental breakfast; alas, I was pleasantly surprised at what was awaiting me in their cafe. 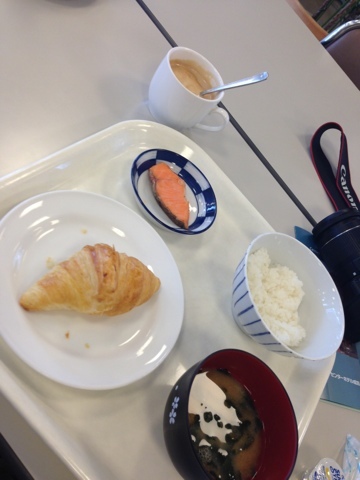 Miso soup, fresh delicious coffee, a small, but delicious, salmon fillet, croissants and of course, the staple of all Asian food groups, white rice. There was only one other person enjoying breakfast at that time and he insisted on changing the TV channel from golf to baseball and then back to golf. An exciting way to start to say the least. 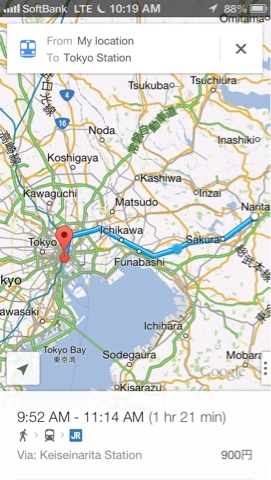 After Check out I jumped back on the train to head into the heart of Tokyo. The ride would take about an hour and twenty minutes. Once again I was lucky enough to get a seat and near the air conditioner to boot! I turned on my Songza, put in my headphones, and watched the spectacle that is Tokyo unfold before my eyes. 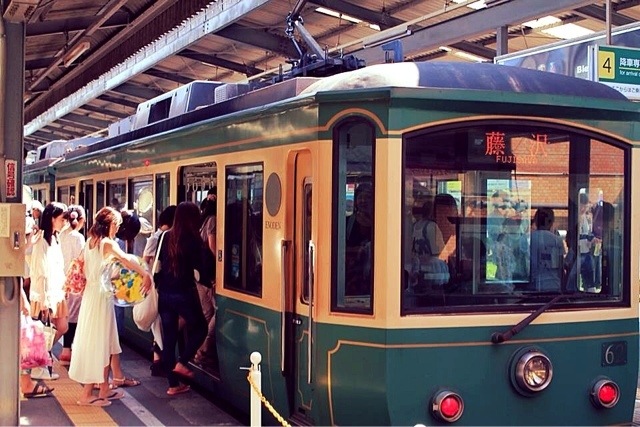 My ride began in Narita which led into a more rural atmosphere as we headed toward Tokyo Station. In my ears the heavenly sounds of Mozart's: 2. Adagio: 2. Adagio, a piano sonata performed by Mitsuko Uchida, gave my train ride the perfect starting ambiance. The view outside was mainly filled with trees, fields and scattered countryside homes. I couldn't help but wonder if one day these quaint places would be overcome by the spread of urbanization. I wonder if the folks who inhabited these places in past centuries could have ever imagined what would become of the places their feet once trod. Many of the folks traveling along with me were straight from the airport. Their weary travelers eyes, big suitcases and the occasional light snooze are obvious characteristics of their kind. In front of me sat a what appeared to be a middle aged Indian couple, though their bag tags indicated that they came from Los Angeles. They must have nodded off half a dozen times each during the trip. They wouldn't really be worth mentioning except for one thing. As the train bobbed and weaved through the countryside their heads would come to rest in peculiar places. The window behind them, the rail next to them, their suitcases and on the shoulders of unperturbed Japanese passengers. 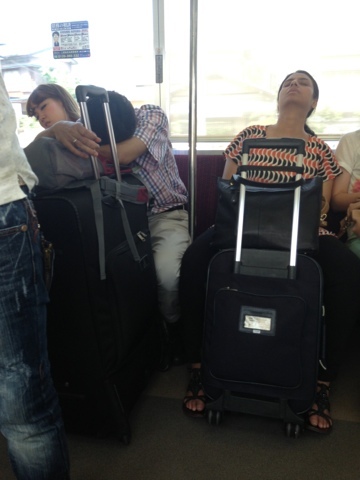 I was surprised to see random people being so patient with strangers using them as pillows. Perhaps it was no big deal, or maybe they were just being accommodating so as not to cause any problems. Regardless it was a sight I took particular interest in. The further we went into the city the more drastic the changes in the scenery. It went from countryside fields to intermixed houses and multistory apartments then finally into a dense jungle of concrete, mortar, tar and brick. Apartments, hotels, grocery stores, spa's, shops and restaurants all merging into the crucible of modern urban life. At one point buildings within the same block couldn't have been separated by more than a meter! It's as if the city is one big onion and our train a needle descending through each layer of its shell. The end of my train trip was at Tokyo Station. 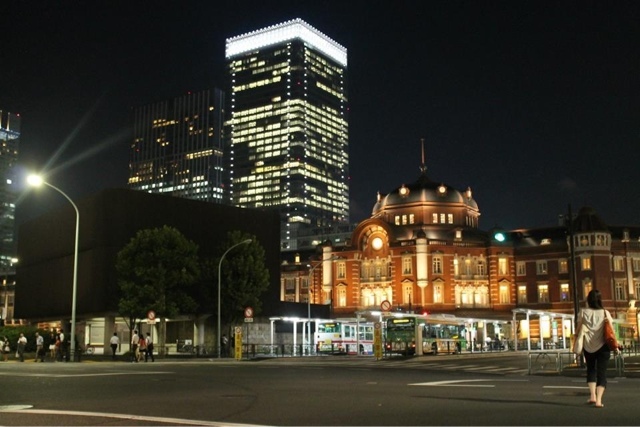 Tokyo station is basically a large hub for both the train and the metro. 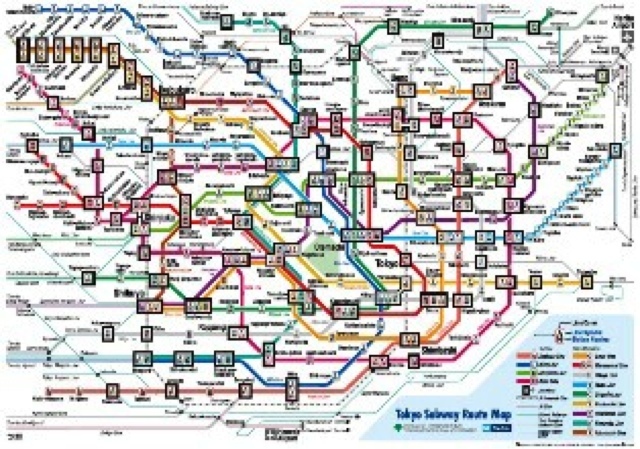 Although the Japanese are incredibly efficient having two different rail systems does make it confusing even for natives. For a total of 45 minutes after getting off of my initial train I wandered about the station in search of a coin locker. EVERY SINGLE ONE on the main floor had been in use. I decided to try to find my train platform and buy my ticket. 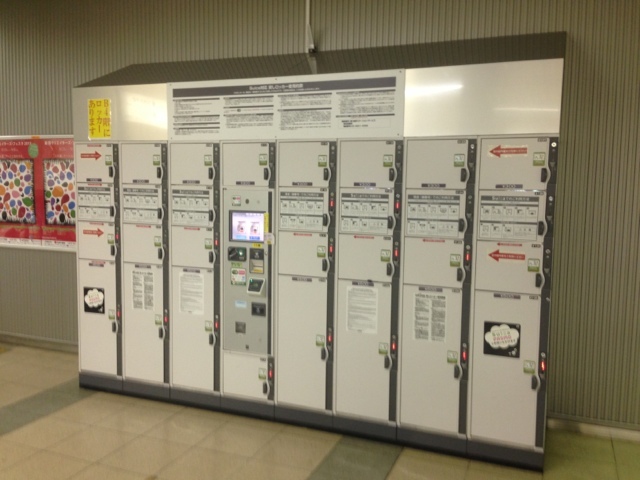 Low and behold as soon as I find the platform (on the B1 floor) an entire bank of coin lockers was available. Lesson of the day: If you find your platform you'll find your locker. Or perhaps as a classic baseball flick once said, "If you build it, they will come." A few minutes later I was bound for Kamakura. Upon arriving I switched trains to a local trolly-like train that makes rounds through the city. It was tightly packed with tourists from all over. Of course most were Japanese; but I heard several other tongues ranging from Russian to German to Spanish. I exited on the third stop, bought several bottles of water (it was bloody hot that day) and took my first steps toward Hasedera Temple. 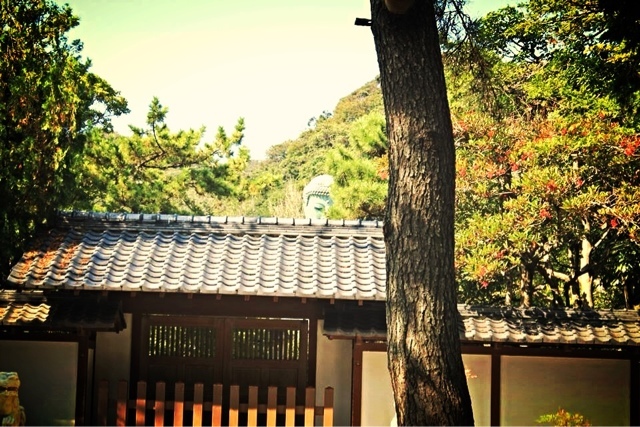 Hasedera Temple was a mere 200 meters from the station. It looked as if it came straight from a picture book. A large gate, with a garden area behind it and a temple atop a hill. 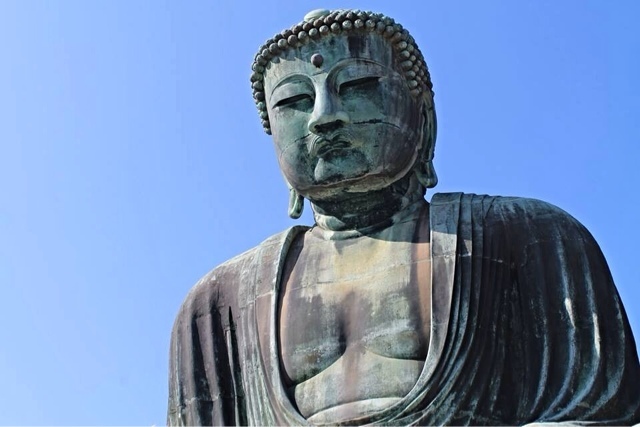 "The statue is one of the largest wooden statues in Japan, with a height of 9.18 metres (30.1 ft), and is made from camphor wood and gilded in gold. 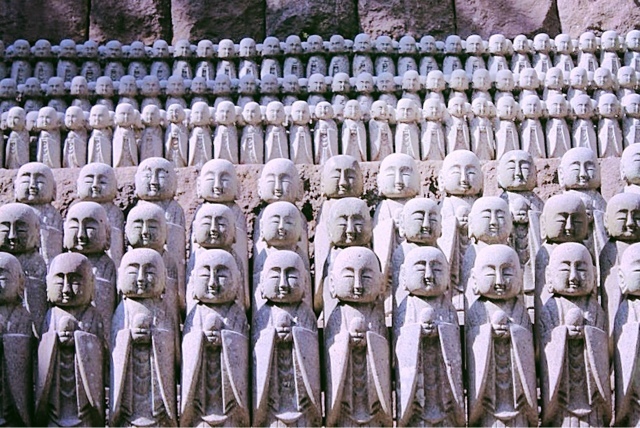 It has 11 heads, each of which represents a different phase in the search for enlightenment. According to legend, the statue is one of two images of Kannon carved by a monk named Tokudō in 721. The camphor tree was so large, according to legend, that he decided that he could carve two statues with it. 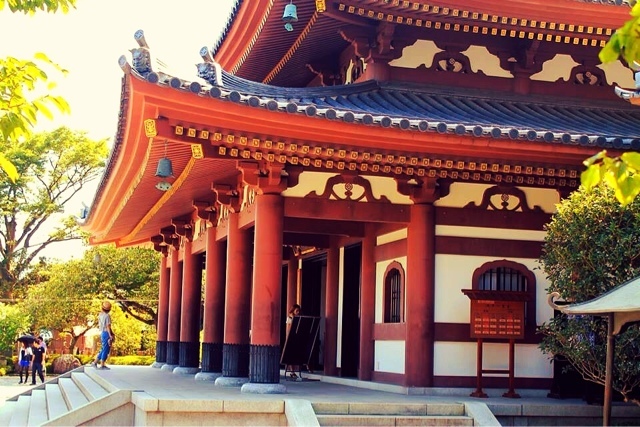 One was enshrined in Hase-dera in the city of Nara, Yamato Province, while the other was set adrift in the sea to find the place that it had a karmic connection with. It washed ashore on Nagai Beach on the Miura Peninsula near Kamakura in the year 736. 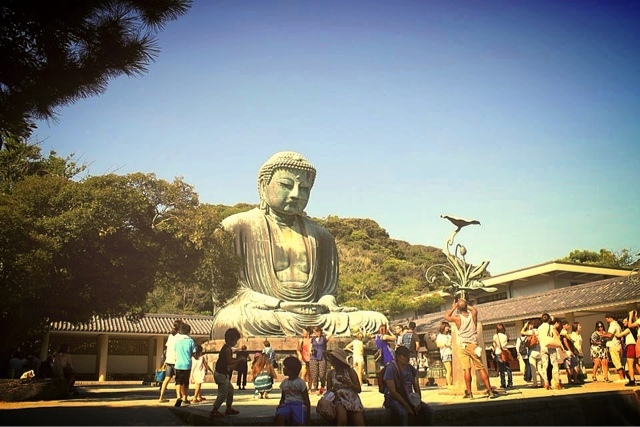 The statue was immediately brought to Kamakura where a temple was built to honor it." This temple has shifted hands through different sects of Budhism but is currently an independent temple of the *Judo-Shu* sect. To be honest I realized I love looking at temples and learning a bit of the history behind them but... I think this is another example of a religious racket. They were selling everything from trinkets to prayer cards to "special beads." I understand that money has to be made in order for the temple to stay open but such outrageous commercialization of a spiritual practice just seems to run counter to the idea's of the religion. Hey maybe it's just me. 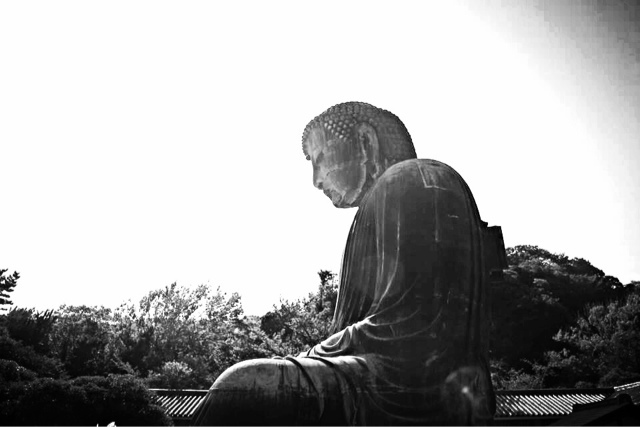 The next stop was the Dai Butsu (The Great Buddha). I had been wanting to see this since my time in Korea. In one of my classes we watched a video from CNN talking about it and I immediately placed it on my bucket list. I wasn't disappointed. The Great Buddha is housed within the walls of the Kotoku-in Temple. 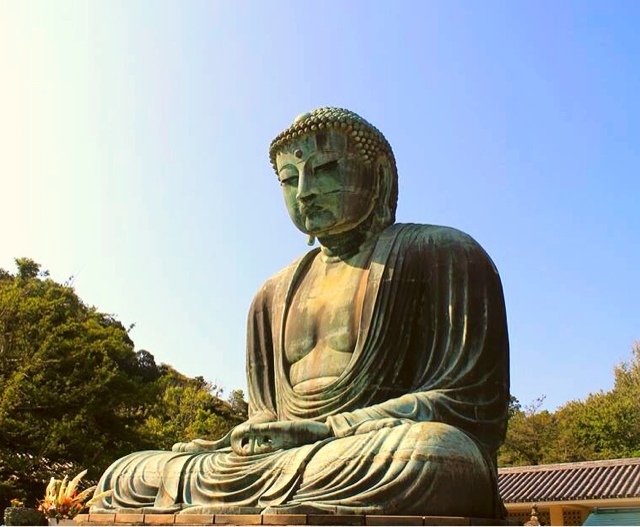 Originally a large wooden statue had been built around 1252 (the Kamakura period for any of those interested). After several storms and the temple continually falling and breaking the wooden statue it was decided to cast one in bronze. 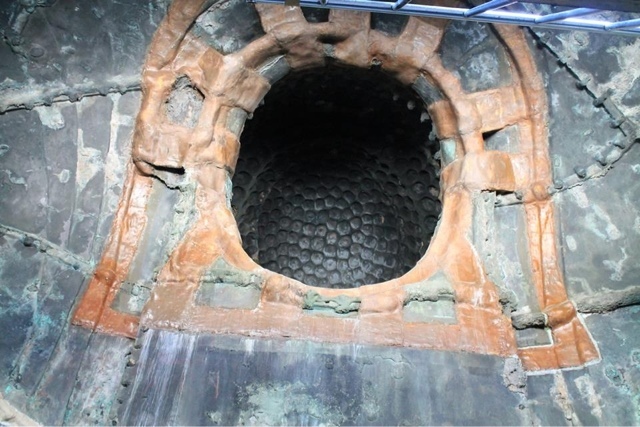 The date it was cast is uncertain but it was initially housed within a giant temple. Well, mother nature does as she wanted and decided to send a tsunami to this region of Japan on September 20, 1498. It destroyed the last temple to house this great monument. Since that time it has sat under blue skies and star filled nights. 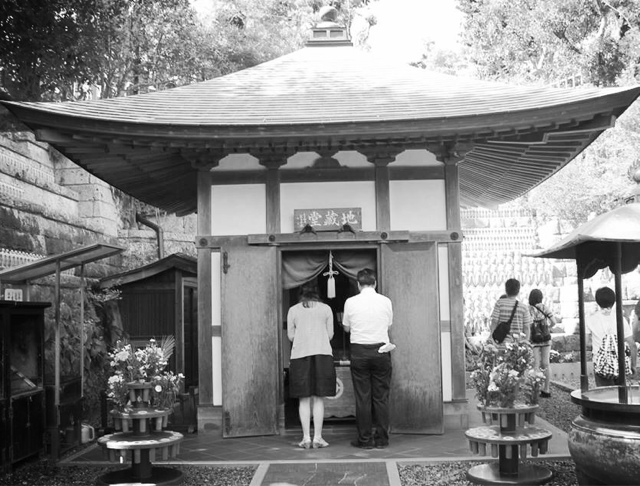 As I approached the temple I noticed the lack of commercialization that I had seen at Hasedera. A few run of the mill tourist shops had been on the road leading there but I wasn't bombarded by the sights of people selling things as soon as I had entered. Outside of the gate you can just barely see the Buddha's giant head. It was like he was watching each and every soul that entered and or passed by. 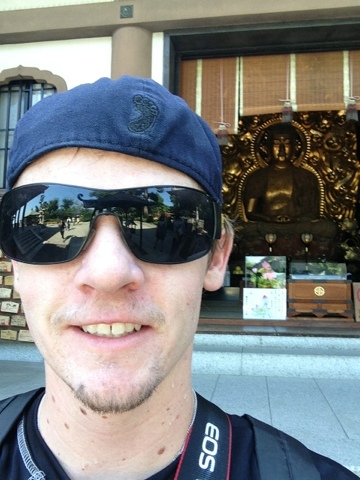 After entering though I realized it was basically just another tourist trap with an awesome statue of Buddha. There was a food corner and another small tourist shop selling the exact same things I had seen at the shops outside of the gate. There was a complete lack of the religious regalia for sale though (outside of incense which can be burned for prayers or respect). Once more I found myself surrounded by people from all corners of the globe. The foreign tongues mixed with the scent of burning incense combined to make a surreal atmosphere (or maybe it was just a bit hot and I was dehydrated). I was surprised to find that they did not have an informational packet available for tourists. Usually these places always have a small brochure explaining the importance of the landmark you are visiting but apparently this one was too big or famous for that nonsense. After walking around taking photo's I decided to venture into the great Buddha. Upon exiting I found two young women praying in front of the statue. One finished her prayers rather quickly but the other stood there praying until I left nearly 15 minutes later. I hope she finds what she was looking for! Overall I was glad to see such a remarkable structure in person. 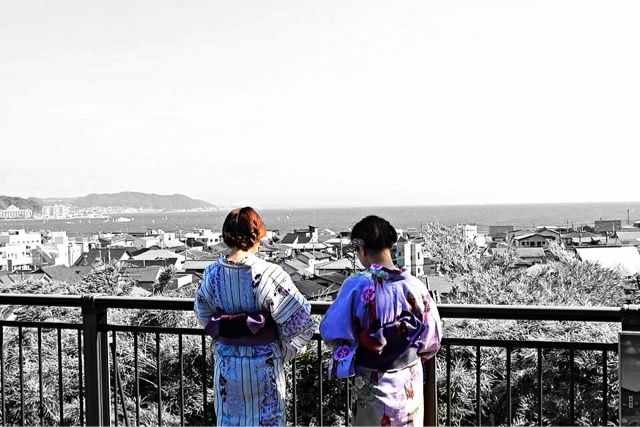 It's a monument that has stood the test of time to become an iconic part of Japanese Culture. 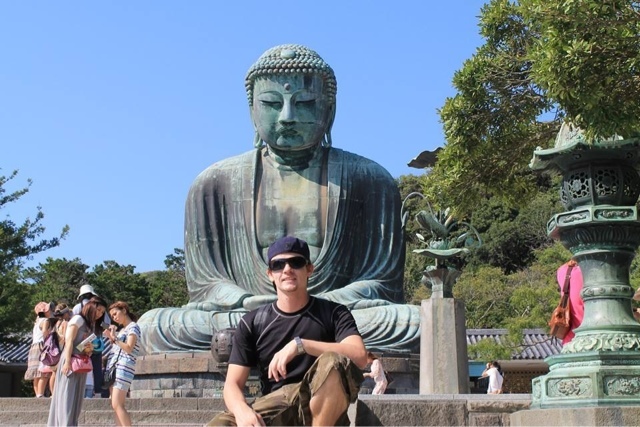 My next blog will continue with my journey through Kamakura and back to Tokyo! I hope you enjoyed this read! Feel free to comment or pose questions! In case you were wondering about those, "thousands of these little guys throughout Hasedera" ---they are jizo statues that are generally erected to the appease the spirits of dead infants (abortions nowadays). Thank you! I had been wondering just that! I couldn't find any information (in English) on them and none of my Japanese friends knew what they were either. thank you for solving another of life's mysteries for me!